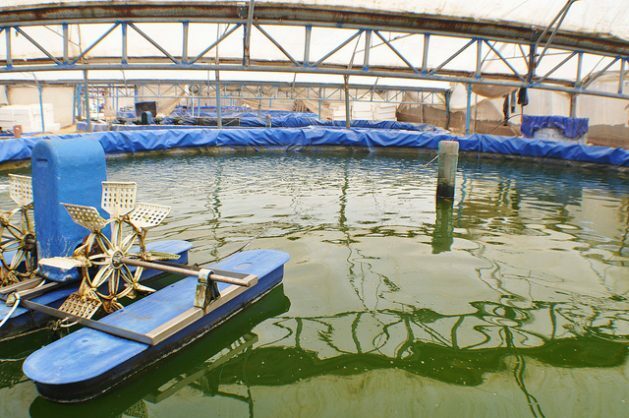 Aquaponics, an innovative practice in the fisheries and aquaculture sectors, is revolutionising the way of conceiving food supply in many MENA countries. This dated picture shows fish pools in Palestine. Credit: Eva Bartlett/IPS. ROME, Dec 7 2018 (IPS) - The Blue Economy is becoming an ‘El Dorado’, a new frontier for traditionally arid and water-stressed nations in the Middle East and North Africa (MENA), according to Christian Averous, Vice President of Plan Bleu, one of the Regional Activity Centres of the Mediterranean Action Plan developed under the United Environment Regional Seas Programme. But against the backdrop of the enormous potential represented by the Blue Economy, there are numerous challenges and critical issues that the region faces. Overfishing, water scarcity, highly salty waters, climate change, high evaporation rates, the oil industry and pollution are just some of things that place at risk the development and conservation of marine and aquatic resources in the MENA region. In addition, rapid population growth throughout the region complicates things. According to the U.S.-based Population Reference Bureau, “MENA experienced the highest rate of population growth of any region in the world over the past century” and is growing at a current rate of 2 percent per year. It’s the second-highest growth rate in the world after sub-Saharan Africa, the organisation says. Population growth leads to an increased demand for fish as a food source and this, combined with poor regulations and rapacious fishing practices, ultimately leads to an overall decline in marine populations. Eventually it compromises the survival status of the Red Sea coral reef, which is already highly threatened by pollution, unsustainable tourism and climate change, (even though corals in this region proved to be resistant to global warming). The MENA region has also had to cope with poor management of water resources, with agriculture using 85 percent of freshwater. Available freshwater in the region is mainly underground and its non-renewable stocks are being depleted, warns the Food and Agriculture Organization of the United Nations (FAO). Over the last four decades, the availability of freshwater in the MENA region has decreased by 40 percent and will probably decrease by 50 percent by 2050. The consequences could be disastrous in terms of food security, rural livelihoods and economies. The Blue Economy: a way to overcome challenges and boost development? “It is very important to promote an ocean-based economy in today’s world, as governments struggle for economic growth, [particularly] in the MENA region as well as in the whole Mediterranean region and in the Gulf countries,” Averous tells IPS. This means that countries in the region should not only seek to preserve aquatic and marine resources, but should also invest in these same resources to foster a process of economic development and growth through them. 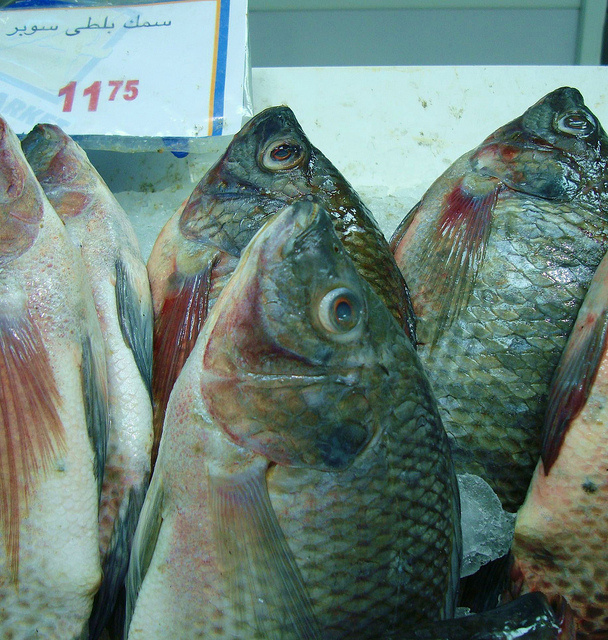 Farmed Tilapia on sale in a Cairo supermarket. Local farmers from Egypt, Algeria and Oman participated in farmer-to-farmer study tours, visited 15 integrated agri-aquaculture farms, and learnt new skills and techniques from each other. Credit: Cam McGrath/IPS. But best practices across the region are demonstrating just how much these countries believe in the enormous potential of the Blue Economy. One example is aquaponics, an innovative practice in the fisheries and aquaculture sectors that is revolutionising the food supply in many MENA countries. Aquaponics is the combination of aquaculture — the practice of fish farming and hydroponics (the cultivation of plants in water without soil). “While hydroponics still uses some chemical fertilisers to grow plants, with aquaponics, the fish themselves, through their excrements, fertilise the water allowing plants to grow,” Valerio Crespi, Aquaculture Officer in FAO Fisheries and Aquaculture Department in Rome, tells IPS. Egypt, Algeria and Oman recently embarked on a cooperation project promoted by FAO, where local farmers participated in farmer-to-farmer study tours where they visited 15 integrated agri-aquaculture farms and learnt new skills and techniques from each other. “It was a good experience,” says Basem Hashim, an Egyptian farmer and consultant for the General Authority of Fish Resources Development, a movement which tries to shape new ideas and actions for agriculture and food in Egypt. Basem took part in the study tours organised by FAO and thanks to that experience was able to outline and understand the most pressing challenges for the farming communities in the region. Aquaponics is an incredible innovation also because it allows these communities to have, thanks to the fish that are raised in those structures, a source of protein that would otherwise be poorly available if not nonexistent in some of these countries. Iran has long-standing experience with rice-fish farming, which is currently estimated by experts to be practiced in 10 percent of all rice fields in the country, on a total area of between 50,000 to 72,000 hectares. Lebanon has been practicing aquaculture for many decades and in 2017 total fishery production from marine capture fisheries and aquaculture were 3,608 and 1,225 tonnes, respectively. Fish farmers in Israel are developing innovative technologies and breeding methods which are revolutionising their industry. The excellence of Israeli technology is not used alone in breeding in the country but is also appreciated and exported all over the world. According to Plan Bleu, in the past 20 years the Gross Domestic Product (GDP) contribution of the tourism sector has increased by 60 percent in Mediterranean countries. The Mediterranean region is the world’s leading tourism destination. International tourist arrivals have grown from 58 million in 1970 to nearly 324 million in 2015. It is also among the most frequented areas by cruise ships in the world, with some 27 million passengers visiting the area by 2013. Therefore tourism has been a positive economic asset for the region. But as surprising as it may be, it is not so much industrial pollution that represents the greatest damage to the marine environment, but tourism that has a huge negative impact on the region. Tourism is in fact one of the main threats to ecosystems in the area. Indeed, locals confirm that industries and cruises operating, for example, in the Red Sea are subject to harsh regulations but the main threat to the environment is posed by waste disposal, especially of plastic, and by the enormous water footprint that each tourist leaves behind. The Middle East certainly has many challenges to face in terms of scarcity of natural resources and food security. For this reason the economy based on maritime sectors in the Mediterranean and in the Middle East represents a crucial potential for the economic development. “We do not have any ‘miraculous’ innovation. We simply have some technologies that, if associated to traditional methods, can stimulate a process of sustainable development, which is a key factor for those countries struggling for finding enough natural resources,” says Crespi.